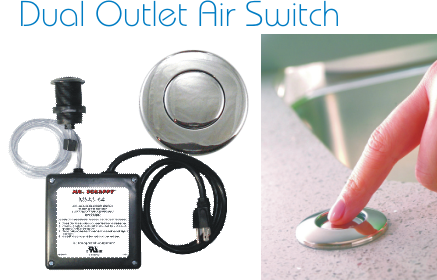 The air switch provides an extra outlet for the hot water dispenser or compactor. Chrome button included. Designer finishes are also available on a special order basis. The disposer is turned ON and OFF by air pressure created by pushing the button. The air travels from the button, through the air tube which is connected to the air switch inside the electrical box. I would like to know if the button for the air switch fit in the pre-cut hole on a stainless steel sink,for example, a BLANCO sink. I want to buy à sink with 3 holes: one for the faucet,one for a soap dispenser and one for the air switch. What is the price of the air switch? Thank you. Hi there, the rubber seal inside my Mr Scrappy air switch button mechanism is ripped from wear and tear. Are these sold separately and available in New Zealand? I have a black stainless steel faucet and black stainless appliances, do you offer this or any other air switches in this color? I cannot seem to locate anyone online that offers this, would love to make a purchase. Thanks for the help.